This blog has been moved to http://rodrigods.com. One useful type of URL query are paging queries, they limit the returned data into a specified range so, since the amount of displayed items are lower, the interface performance is improved. There are no new features to be implemented, so the effort in this final week is to polish the code and improve documentation. Will return the first 10 metadata info (ordered by last modified date) after the media with id equals to foo. Next monday (13th), is the suggested pencils down from GSoC 2012. It was a pleasure to work with the buddycloud team, and I've learned A LOT during this period. Finished the XEP-0070 implementation, the Media Server was ready to be deployed, and yesterday the first tests with Denis' HTTP API + Media Server were excellent! Some bugs, of course, but already fixed, and we are very excited with the result of our efforts. 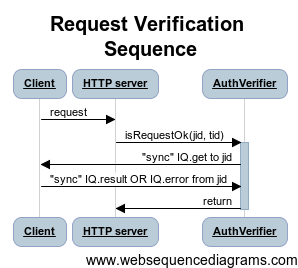 In both ways, the client's JID and transaction id, are separated by a ; and are base 64 encoded. This week, we hope to do the first deploy, to finally see the Media Server running in a production environment! - After that, the next step is the implementation of the XEP-0070 and documentation.